The world’s largest single source of energy consumption and production is petroleum. Thanks to the American shale industry, domestic petroleum production is growing at a record pace. Spearheading this growth are petroleum engineering specialists who help make this energy available. Students working toward their online petroleum engineering degree take courses in geology, chemistry and advanced mathematics. This guide walks through what it takes to get an online degree, as well as what graduates can expect once they have the degree in hand. Studying a career in petroleum engineering gives students the opportunity to learn the area-specific information needed to kick-start their career in the field. With many schools now offering online learning options, students are now able to earn these important credentials with the flexibility needed to maintain their current time obligations. 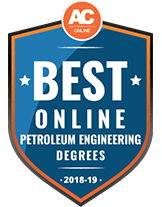 We’ve created this list of the top petroleum engineering programs for 2018 to help students find the best learning options that offer online learning. Explore this ranking list below. Accredited by the Higher Learning Commission, Aims Community College offers a 2-year program to earn an Oil & Gas Associate of Applied Science degree, which requires 37 credits for graduation. A number of mandatory classes can be completed through the Aims Online Campus. Support for these courses can be found through online tutoring, advising and technical support. Whether students take classes on-site or online, a 2.0 GPA must be maintained in order to finish a program. The Aims Foundation awards over 80 different scholarships to assist in paying for tuition. The bureau of labor statistics provides the following data about job growth in the Petroleum Engineering industry. As well as the following national median salary data for several different careers in the field of Petroleum Engineering. Earning an online petroleum engineering degree opens doors to many opportunities in the field. Here is an example of what a life in petroleum engineering could look like, including major career and academic achievements. 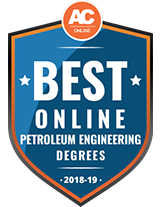 By enrolling in an online petroleum engineering degree program, students can still receive a first-rate and complete education, yet enjoy the convenience and flexibility of online learning. Online students will need to have access to the Internet and an up-to-date computer which can run web-based programs and tools – in today’s online degree programs, all information is conveyed through lectures, video chats and the like. Generally speaking, the primary difference between online and traditional campus-based programs is minimal. Online programs allow students to take classes remotely, but all other requirements, such as admission standards, assignments and tests, are the same. There are some schools that are exceptions; for example, in an online master’s degree program, only the non-thesis track may be available. Even though online programs allow students to take classes online, that doesn’t always mean it’s self-paced; students may be required to complete their coursework at the same rate as their on-campus student counterparts. Some online petroleum engineering programs require students to visit a physical campus from time to time, such as for attendance of on-campus labs. Currently, most online petroleum engineering degree programs are available only at the master’s level or in the form of graduate certificates. The petroleum engineering master’s degree is by far the most common online degree available in the field. Taking master’s degree courses online is quite popular, as many students already have full-time jobs and have settled down in a particular location when they decide to pursue further education. As a result, the master’s program is designed for students who are already working in the petroleum industry and/or as an engineer. In order be accepted into most online master’s programs, applicants must have either a bachelor’s degree in petroleum engineering or another similar engineering field, such as civil, chemical or mechanical engineering. Once accepted, students can expect to take 30 to 36 credits and about two years to complete their degree. However, some programs offer accelerated courses that allow the master’s degree to be completed in less than 18 months. Students can expect to take a base set of core courses along with electives, allowing them to specialize in a particular area of petroleum engineering. There is also the completion of a thesis or a petroleum engineering project. Not all online programs have the thesis requirement, although if no thesis is required, a research project will usually take its place. In most online master’s degree programs in petroleum engineering, there are no on-campus requirements for completion of the degree. This means every single requirement can be completed through distance learning. Petroleum engineering certificate online programs are almost all found at the graduate level. These programs are intended for those who are already working in petroleum or a related industry and desire more in-depth knowledge about a particular specialty. Depending on the school offering the certificate, most programs consist of four to six courses or 12 to 16 credits that can be taken over the course of one to two semesters. In order to be accepted into a certificate program, a bachelor’s degree in petroleum engineering or a closely related field (such as mechanical, civil or chemical engineering) is required or strongly recommended. Even if a bachelor’s degree isn’t required, the certificate program courses necessitate a strong foundation in science, math, petroleum and engineering concepts. This means a plethora of prerequisites in relevant courses is required, as well as experience in the petroleum engineering field. There are very few online bachelor’s degrees in petroleum engineering offered. Of the ones that do exist, few, if any, are accredited by ABET. However, this might be due to the fact that online bachelor’s degree programs in petroleum engineering are fairly new, so schools are in the process of developing the online bachelor’s degrees and getting those programs accredited. In the next few years, online petroleum bachelor degrees should become more widely available. The course covers the fundamentals of extracting petroleum from underground reservoirs. Well construction and drilling activities will also be addressed. Students will learn about mechanical and scientific concepts relating to fluid dynamics, drilling safety and production stimulation. The relationship between energy use and consumption and how they relate to society will be analyzed. Issues such as pollution, refining and petroleum extraction’s impact will be discussed. Students will choose a project that is approved by the appropriate committee and reflects the students’ understanding of advanced petroleum engineering theories and the ability to apply those concepts to real world issues. The technical challenges of extraction, transportation and storage of petroleum products will be covered. Students will also examine how to choose the right hardware for a given extraction goal. Confirm that the school is accredited by the appropriate organization, such as ABET. Figure out your goals for getting the petroleum engineering degree and make sure the school has offerings that can help achieve those goals. Identify the application requirements, such as prerequisite degree and prior academic record. Review tuition and other program costs and make sure you can afford them and that you will be able to recover on your education investment. One of the biggest reasons for getting a degree online is convenience. Double check to make sure your understanding of on-campus requirements, if any, is correct. Speak with recent graduates of the program you’re interested in. If possible, visit the school and meet with current students and/or an admissions officer. Research what assistance the career services office provides to its students and graduates. Look into any financial aid options that may be available. If you’re a full-time employee already, don’t forget to ask your employer to see if there are any tuition assistance work benefits. Accreditation is vitally important when looking for any college program, including one in petroleum engineering. Accreditation ensures that the school or program has been evaluated by an independent body and found to meet at least the minimum standards of a quality education. When it comes to petroleum engineering, there is one organization that handles accreditation of programs. In the context of petroleum engineering and engineering in general, the primary accrediting organization is ABET. ABET is a nonprofit organization which accredits college and university programs in the applied science, computing and engineering fields. ABET accredits programs at the associate, bachelor’s and master’s degree levels. In addition to organizations that accredit specific programs, schools may receive regional or national accreditation with regard to the school as a whole. Which organization accredits a particular school largely depends on the school’s geographic location. For more information on regional and national accreditation, visit the U.S. Department of Education’s Database of Accredited Postsecondary Institutions and Programs and our complete guide to accreditation. There are several requirements for those looking to enroll in an online petroleum engineering master’s degree program. From prerequisite degree requirements to standardized tests to finding a way to pay for school, there are several steps that carry a student from the decision to pursue schooling to actually starting that first day of classes. The following chart lists a few major steps for entering a petroleum engineering master’s degree program. In addition to having stellar GRE scores and academic credentials, applicants can take other steps to improve their chances of getting into the petroleum engineering program of their choice. Join the Society of Petroleum Engineers. Not only do members get networking opportunities and access to information related to petroleum engineering, the society also has scholarships available for members. Get a petroleum engineering bachelor’s degree. If this degree isn’t available at your undergrad school, get an engineering degree in a related field, such as chemical engineering. Obtain relevant work experience. Some online master’s programs will allow students to waive the GRE test requirement if they have enough petroleum industry experience. Write a paper on a timely petroleum industry engineering topic. This will provide additional evidence of your interest in petroleum engineering. Though becoming a petroleum engineer is the most obvious career path for those who are pursuing a petroleum engineering degree, there are other potential jobs that might be open to graduates. Below are some of the most common options for those who graduate from the petroleum engineering program. Petroleum engineers design methods to extract petroleum products from beneath the ground. Most petroleum engineers focus on one particular aspect of the extraction process, such as improving extraction efficiency, developing drilling techniques to obtain petroleum previously unobtainable or ensuring safety for personnel and the environment during the drilling process. Geoscientists study the physical makeup of the Earth for a variety of applications including searches for oil, gas and other reserves of natural resources. A geoscientist’s work can include working in the field surveying and taking samples as well as conducting laboratory tests and analyzing data. Industrial engineers design and develop hardware used for industrial applications. Most often, this includes production, refining, manufacturing and logistical operations on the large, industrial scale. Materials engineers do exactly what their titles indicate: they design and develop new materials or modify existing materials for new applications. Geological engineers identify locations for minerals deposits and help develop ways to mine the identified mineral resource. Geological engineers may also design mines and make sure those mines are operated safely. For the most part, petroleum engineers do not have to be licensed. However, if they would like more responsibility in managing other engineers, being responsible for projects or offering services directly to the public, they would need to become a Professional Engineer (PE). Since each state has its own licensing requirements, engineers need to go through the licensing requirements for each state in which they will work. However, many states have reciprocity with other states, such that a licensure in state A may be accepted in state B as long as state B accepts licenses from state A. One of the most widely recognized certifications for petroleum engineers is granted by the Society of Petroleum Engineers (SPE). This certification is recognized around the world and shows the petroleum engineer holding the certification has a requisite amount of knowledge in the field. The exam requirement may be waived for petroleum engineers who are PEs or are otherwise licensed. Petroleum engineering isn’t the only high-demand engineering career with distance learning options. Below are three similar engineering degrees that can all be obtained online. As the name states, electrical engineers work on electrical equipment as well as the electrical components of other types of equipment, devices and vehicles. The bachelor’s degree is the minimum needed to become an electrical engineer. Master’s degrees are also available online and are more common than online PhD degrees. Mechanical engineering is a very broad field; essentially, it deals with almost anything that has moving parts. A bachelor’s degree is the minimum needed and can be obtained online. The master’s and doctorate degrees are also available online. Master’s is the most common, where students can expect to take specialized classes such as manufacturing design as electives. Civil engineering concerns the design and construction of buildings and infrastructure such as bridges, canals and roads. As with most engineering professions, a bachelor’s degree is the minimum required. However, a master’s and PhD are also available online, with the master’s degree being more common.